AgitarOne has been the world’s leading Java unit testing solution. With the addition of the Functional Coverage Tracker, AgitarOne is jumping into the functional testing arena! AgitarOne already has been providing code coverage reporting for unit testing - on the JUnit tests automatically generated by AgitarOne, on any or all of your manually generated JUnit tests, and on AgitarOne's Agitator behavioral tests. 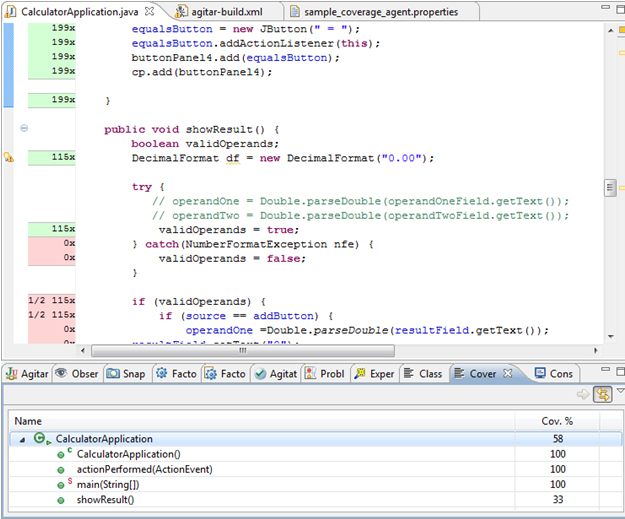 With the Functional Coverage Tracker, AgitarOne now also tracks code coverage for functional testing of Java applications. 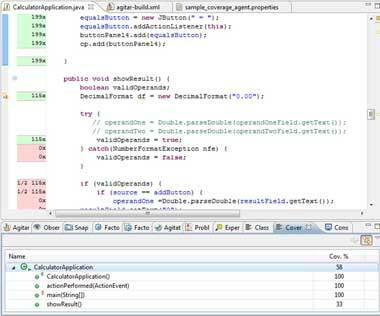 The Functional Coverage Tracker uses a coverage agent to obtain code coverage data during your testing of Java applications, under any Java runtime environment. This can include testing of functionality for any test methodology and any test phase (e.g., unit, integration, system, acceptance). Code coverage data from functional tests is imported into AgitarOne, and is presented in the same easy to use GUI and executive dashboard already available. The importing and reporting also take full advantage of the robust Continuous Integration and Command Line Interface capabilities.